AMPCARE’s ESP™ (Effective Swallowing Protocol) unites the benefits of electrical stimulation while incorporating proper postural strategies and a protocol of swallowing exercises. This systematic rehabilitation approach provides Speech and Language Pathologists (SLPs) with the tools to accelerate and restore their patient’s swallow function. · Achieving ideal head & neck alignment for optimal muscle strengthening. · Maintaining placement & improving conduction of E Series electrodes. · Providing resistive exercise component to anterior neck musculature. 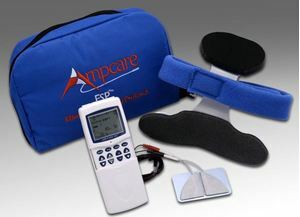 The Ampcare ESP™ is a FDA-cleared sophisticated treatment modality that uses neuromuscular electrical stimulation and a Neuro-orthotic to enhance the efficacy of your pharyngeal strengthening exercises. The ESP™ system can only be prescribed by a clinician. By utilizing the Ampcare portable handheld device with adjustable parameters along with the E Series Electrodes and the RPD, the therapist will provide a more extensive exercise experience for the patient with dysphagia. Ampcare’s E Series Electrode is specifically designed to fit the submental region to achieve maximum stimulation of the suprahyoid as well as the pharyngeal musculature without searching for a specific motor point. The E Series Electrodes are reusable, pre-gelled, self-adhering, latex free and are for single patient use. The electrodes are FDA-cleared for use on the swallowing musculature. Restorative Posture Device (RPD) is a neuro-orthotic (brace) used to provide the ideal head and neck position to allow for the most efficient muscle contraction needed to promote a functional swallow. This device also serves as a part of an emerging resistive exercise protocol. When comparing the amount of electrical activity in the suprahyoid musculature using EMG while performing a chin to chest resistant exercise using the RPD, clinical data has shown a 100% increase in electrical activity vs. a basic “head lift” exercise.